A mouse can make a pretty good living in the camps scattered along the shores of Fish in a Barrel pond. 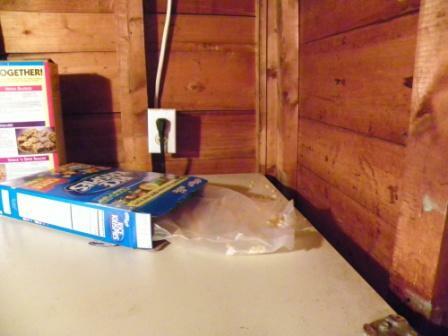 Toaster crumbs alone will support a surprising number of rodents but when you add open bags of chips and peanuts, puddles of grease on the stove and spilled cereal on top of the refrigerator, entire colonies can spring up, seemingly overnight. Some members of the Neverwas Nonesuch Angling Society will adopt a mouse in their camp, as a mascot of sorts, leaving treats on the mantle and laughing with delight when their furry little friend descends the stone face of the chimney, grabs a Cheetos™ and scurries back up through a hole in the ceiling. Those folks marvel at how quickly the mouse returns for another load, forgetting that mice pretty much all look the same and that what they are seeing is really a multi-generational assault, with mouse after mouse lined up above the ceiling like paratroopers in a plane. Other groups take a different approach to the near-infestations we see from time to time, placing traps in strategic spots to cut down the numbers or at least provide a pleasant evening’s diversion. 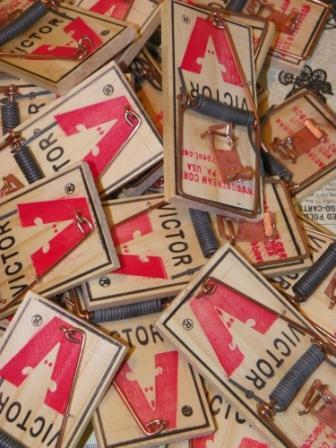 Some even make a game of it, putting their initials on mouse traps and seeing whose trap is sprung first. With a dollar per trap in the pot the winnings add up fast, especially when there is the chance for more than a dozen rounds of this little game before bed time. Of course, the action slows down as the numbers drop after a couple of nights, but mice are prolific and their population bounces back in no time at all. Being more a game of skill, rather than of chance, it’s not really gambling and it helps me out so I am always happy to provide as many traps as they can set (when all else fails, my friend Eugene has a way to deal with a bumper crop of mice). Some folks have a harder time than others accepting the mice as a fact of life at old fishing camps like this. I do what I can to help them out, knowing how delicate their urban sensibilities can be. For example, when someone says to me, “Quill, I didn’t sleep a wink last night because a mouse was making so much noise,” I gather as much information as I can and offer up an appropriate amount of sympathy for their plight. “What was the mouse doing?” I will ask. “And where was your bag of chips?” I will ask, feigning genuine concern. I will tell them I will come over and do something that very evening, and what I will do when I get there is put their darn food in the fridge, coolers and containers I provide for just such occasions, where the mice can’t get it. Keeping a clean camp goes a long way to limit problems with mice, and some people are beginning to understand, making things a little nicer for everyone, but indoor cleanliness and mice are just a start. Looks like it might be time to move on from cookies and chips on the counter and have a little chat about tossing canteloupe rinds out the door and pouring bacon grease next to the steps. I’ve had the privilege to own homes a couple of times, but most of the time, I rent. There have been two instances where I’ve moved because the mice won. You shouldn’t have to stand off to the side when opening a kitchen cabinet just so you don’t get nailed by a mouse that comes flying out. Even containers became useless unless they were made of metal. I have plenty of of Rubbermaid bins with holes chewed through them. 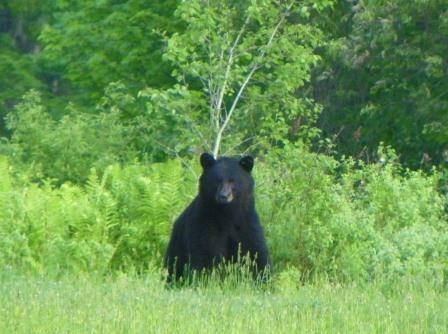 Wildlife seems to puzzle the average person. This is good stuff, you should write a book. A clean camp is a happy camp…lesson learned from many fishing and hunting camps. Bacon grease off the back step…still laughing! 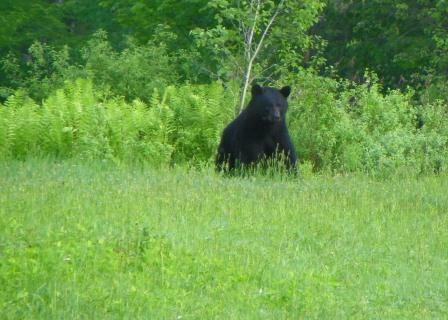 Great photo of the bear!